Ideal for school, work and carrying your kit and essentials, protect your valuables with the VX3 Core Backpack in Navy and Dark grey. In a predominantly navy design, this bag uses grey zips for detailing and a small red section at the bottom. 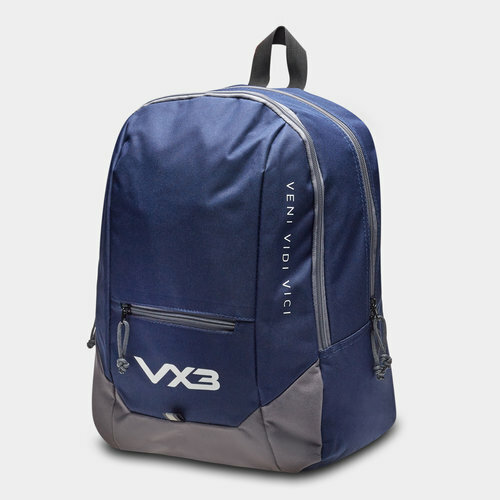 The VX3 logo is printed at the bottom of the backpack whilst the slogan 'Veni, Vidi, Vici' is printed diagonally on the side of the front large pocket. Store your essentials in confidence and keep them safe and dry with the VX3 Core Backpack, essential for any active person always on the go.